What do you know about cars? Good news for fuel guzzlers! If someone had a pound for every time I got a parking ticket…. Hold on a minute, they do! And they’re filthy rich. It has come to light that councils in England are making a record amount of profit, in 2013/2014 year they made £667 million from parking operations, £667 million!! Profit!!!! It seems I’m in the wrong business. 2012/2013 wasn’t too bad for the council either as they made £594 million, another interesting stat revealed that a whopping 44% of all of that money came from London boroughs. On the other hand there are parking authorities, in what I can only imagine are very well behaved areas, who have made a loss, 55 of the 353 in total. I can’t imagine it is the fault of the parking inspectors, just the other day I illegally parked my used Vauxhall Astra in Cleckheaton for literally 45 seconds as I ran into a shop, and I came out to a ticket. 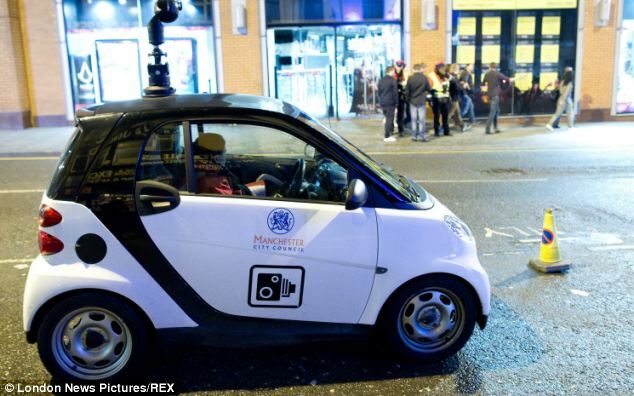 According to Eric Pickles this rise in profits can be attributed to the industrial use of CCTV spy cars, like the pictured Smart Car in Manchester above. You maybe thinking, oh well, at least they might use some of this huge profit to pay for new/better roads, but you would be wrong to think that as in the last five years spending on local roads has gone down by 25%. On the other hand, Professor Stephen Glaister has said that the increase in parking profits may actually be down to the cuts in the cost of parking operations, hence, the profit is up because the expenditure is down. Further good news for drivers is that CCTV spy cars are to be banned and any tickets will have to be placed directly on the windscreen, though normal CCTV can still be used to issue postal tickets for offences on red routes, bus lanes, school zones and bus stops. The government have done this as they think that this profit driven way of dealing with parking has put people off using town centres for their shopping, and have turned instead to online alternatives.